Three Muslim Brotherhood supporters who caused a row in Egypt last year after they met with Obama administration officials and members of Congress returned to the U.S. Wednesday, according to the Facebook page of Egyptian Americans for Freedom and Justice (EAFJ). During their 2015 trip, Brotherhood leader Gamal Heshmat, former Egyptian Judge Waleed Sharaby and Maha Azzam, head of the Egyptian Revolutionary Council (ERC) lobbied State Department and White House officials for help against the government of Egyptian President Abdel Fatal al-Sisi. The ERC formed in 2014 with the aim of toppling Sisi and bringing the Brotherhood back to power in Egypt. Sisi took power in 2013 after the Egyptian army ousted President Mohamed Morsi, the leader of the Muslim Brotherhood's Freedom and Justice Party. Heshmat has a long history of supporting Palestinian terrorists and was photographed in June 2014 with Hamas political chief Khaled Meshaal. The State Department agreed with the delegation's position that Sisi had not brought stability to Egypt, and that his removal would pave the way for a transition to democracy, Sharaby told Egypt's Mekameleen TV in an interview last February. But that has not translated into concrete action to topple Sisi. 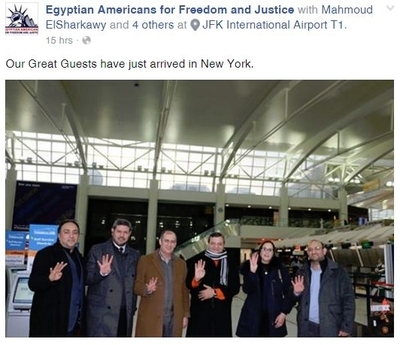 EAFJ leaders Mahmoud El-Sharkawy, Hani Elkadi and Aber Mostafa greeted Heshmat, Sharaby and Azzam at New York's JFK airport and posed for a picture with them displaying the Brotherhood's four-fingered Rabaa salute which has become representative among those wanting the Brotherhood's return to power in Egypt. The three are scheduled to speak Friday at an event titled "Egyptian Revolution from Sacrifices to Victory" in North Bergen, N.J. The event is timed to commemorate the Jan. 25 anniversary of dictator Hosni Mubarak's fall from power in 2011. Heshmat wrote that his group had no plans to meet with Obama administration representatives during this visit, due to their "position biased" toward Sisi's regime. They hope to speak with some congressmen, academics and others. El-Sharkawy is a Brotherhood member and serves as liaison with Brotherhood members exiled in Turkey, Egypt's Al-Bawaba newspaper reported last April. He frequently reposts Muslim Brotherhood communiqués on his Facebook page. In December, El Sharkawy encouraged "all youth and revolutionaries" to distribute the official page of Brotherhood spokesman Muhammad Muntasir. 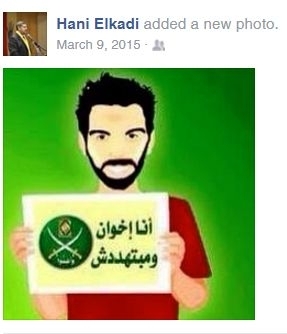 Elkadi seemed to self-identify as a Brotherhood member in a March 9 Facebook post showing an cartoon of a man holding a sign with the Brotherhood logo and the words which translate to, "I am [Muslim] Brotherhood and I'm not threatened." Last year, Elkadi, El Sharkawy and Mostafa posted graphics on their Facebook pages seeming to support violence in Egypt. El Sharkawy and Elkadi posted a Feb. 10 communiqué from the Popular Resistance Movement (PRM) which has launched attacks against Egyptian police and other targets. It features an image of a blood-red map of Egypt with a fist superimposed over it. It claims responsibility for targeting two police cars. "God, martyrs, Revolution," it said. Mostafa posted the personal information of a pro-Sisi owner of an Egyptian soccer team with the word "Attaaack!" the same day. They are using our countries hospitality to speed their agenda of converting the world to Islam. It would be suicide for an infidel to hold a sign condemning Islam and walk through a Muslim neighborhood chanting down with Islam? PM David Cameron is a prime example of someone who needs to have their eyes and ears checked out by an INFIDEL MD!